Well you would too especially when they start giving away Free Ice Cream Cones for the entire day! Ben & Jerry's is one of my favorite ice cream brands. I love the fun flavors available and the names that goes with it. For instance, have you ever tried Maple Treehugger, Clusterfluff or the Scotchy Scotch Scotch? These names will definitely get you to laugh as you wonder what makes up these creations. We love having pints of Ben & Jerry's ice cream at home with the Strawberry Cheesecake as our top favorite. During the weekends, Paul and I would also drop by the Ben & Jerry's store in Vivo City for our ice cream fix. 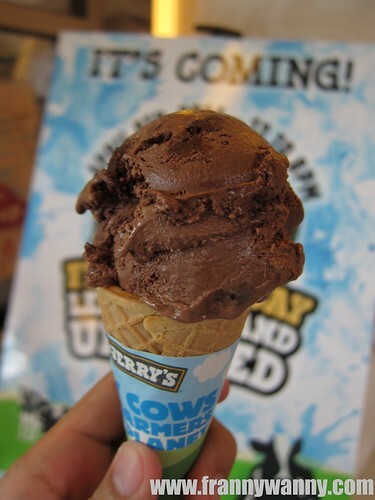 Last Tuesday, 8 April 2014, Ben & Jerry's had their annual Free Cone Day! Of course, Paul didn't pass up the chance to be part of this yearly tradition which began back in 1979. 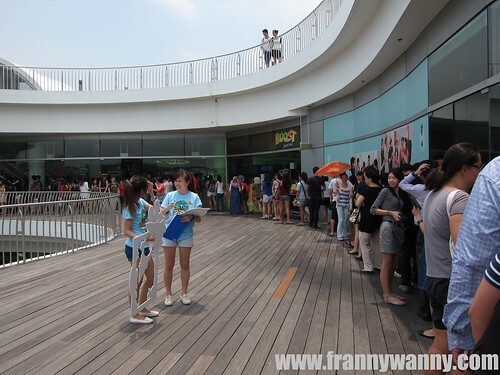 He got there at around 1230PM and look at the queue that greeted him! It snaked all the way outside the store, outside the mall, further out a bit more. Under the noontime sun, people patiently waited in line for their turn at the counter. 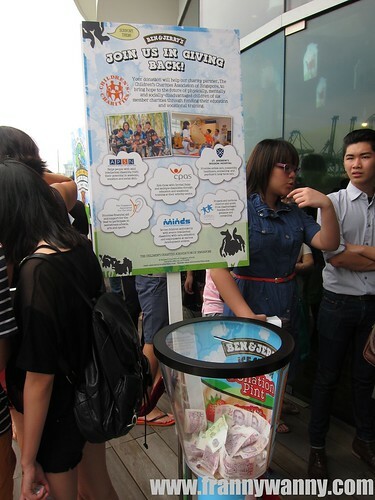 As they queued up, staff crew of Ben & Jerry's were there to assist and to monitor the line situation. They also gave out a sticker per customer to celebrate the event. 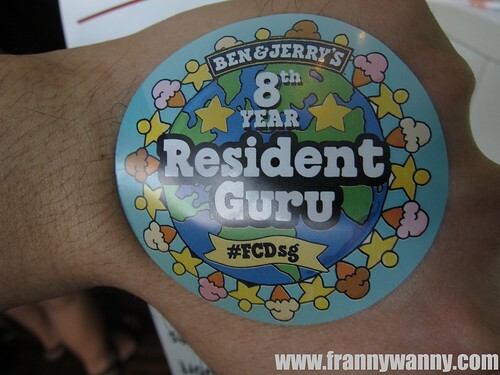 Paul is definitely a certified Ice Cream Guru so this sticker suits him just fine. One thing that we love about Ben & Jerry's is that it's a company with a heart. Here's a sample of them supporting a number of local organizations here in Singapore so they have a collecting box for customers who would also like to give help. It didn't took Paul that long before he finally got to the counter. According to him, he waited for about 30-45 minutes which shows how efficient the staff and service were. Well, nothing surprising as everything is pretty much quick and efficient here in Singapore! Truly love this country! 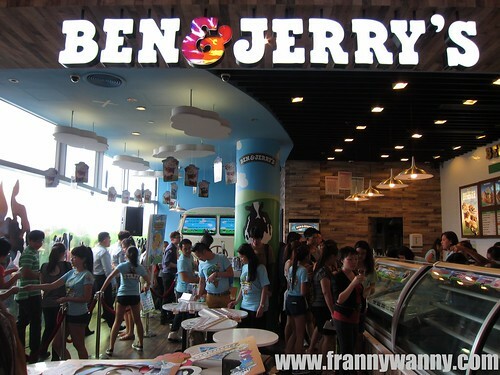 Visit Ben & Jerry's in Vivo City (Harbourfront MRT), Great World City (River Valley), Dempsey Hill and at the Singapore Zoo Entrance. ARGH! 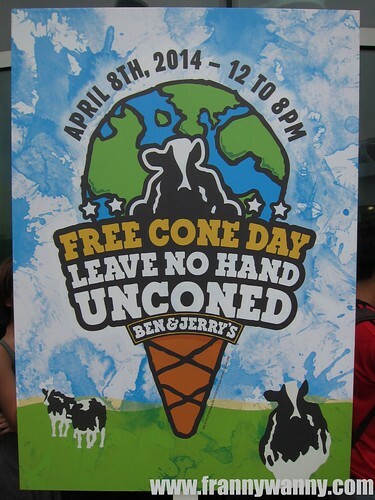 I can't believe I missed Free Cone Day *cries* Were B&J supporting any charities this year? yes they were :) cant recall which ones though. 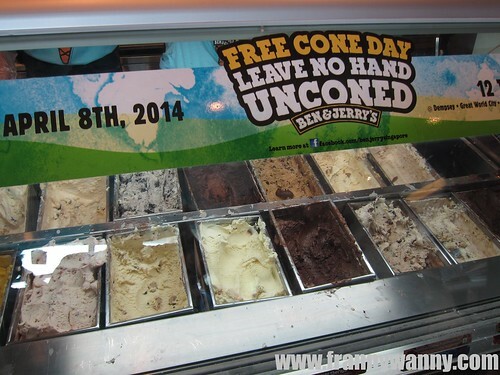 Don't worry there's always Free Cone Day 2015! !